Hospital pharmacist Alex Benedict is engulfed in a perpetual battle against death in his professional life and haunted by its grim specter on a personal level. Benedict happens upon a shocking piece of evidence, leading him to conclude that one of Tidewater Regional Medical Center’s own pharmacists, Michael Watson, may be involved in the demise of several patients. Watson leaves Benedict a recording implicating himself while purporting an incredible claim and urging Benedict to become the steward of a powerful compound. Watson has separated the compound’s formula into three pieces and disguised their locations in the form of quatrains. If Benedict can bring the sections together, he is promised the opportunity to lift the black cloud of death from his own life. After witnessing the compound’s power, Benedict embarks on the quest to solve the riddles. A frantic, life-and-death pursuit ensues, stretching up and down the east coast. Benedict must elude the lethal grip of the secret cabal that wants the formula back as Tidewater Regional undergoes a crucial inspection. In the story’s stunning climax, Benedict races to alter his fate and is asked to make an incredible, life-altering choice. 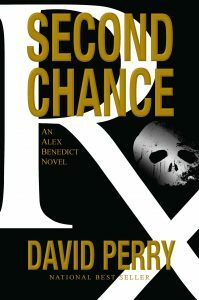 Second Chance is another brilliantly woven tale of suspense and intrigue in the world of pharmacy. Perry challenges his readers with a clever, fast-paced plot offering bombshell twists at every turn.